Don't let a lack of storage diminish your ebike fun! The brilliant CX2 model from Cyclamatic folds in half for easy storage and transportation wherever you are going. Ideal for travelling holidays and those with minimal storage space, the e-bike folds quickly and easily into an incredibly compact space. The bike folds at a mid-point on the cross bar and the stem of the handle bar with a unique quick-lock-release system. This system makes sure the bike can be folded and assembled in under 5 minutes whilst maintaining an unfaltering, strong frame when ready for use. Quick release front wheel. 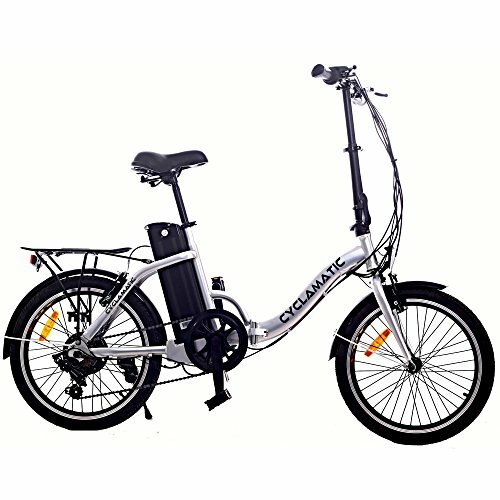 Fitted with a 250w brushless motor the foldable bike will easily assist you to travel at the 15mph road speed limit. The motor is extremely low maintenance promising a healthy motor life. Capable of a 25-31 miles range on normal terrain. The upgraded 36V and 8.8AH lithium-ion battery provides huge power you can rely on when you need it with a very low self-discharge rate. If you have any questions about this product by Cyclamatic, contact us by completing and submitting the form below. If you are looking for a specif part number, please include it with your message.